Spring has most definitely sprung, and Cornwall is beginning to buzz. 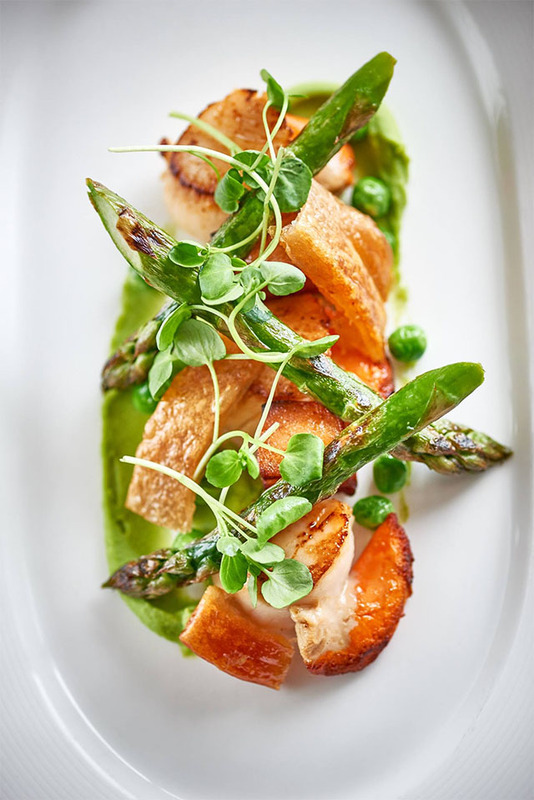 The sweetest spring vegetables, including some super-early asparagus, are on menus; fish and shellfish are particularly good; and look out for the tender spring lamb. There’s lots going on over the next few weeks, with plenty of special Mothering Sunday and Easter menus, and many seasonal cafés reopening for the school holidays. Keep reading for our round-up of food news and events across Cornwall this month. Scroll down or click here for Diary Dates. Porthilly Spirit is a brand new independent festival which will be held on a farm near Rock over the weekend of 24 to 26 May, and has a dream line-up for food-lovers. 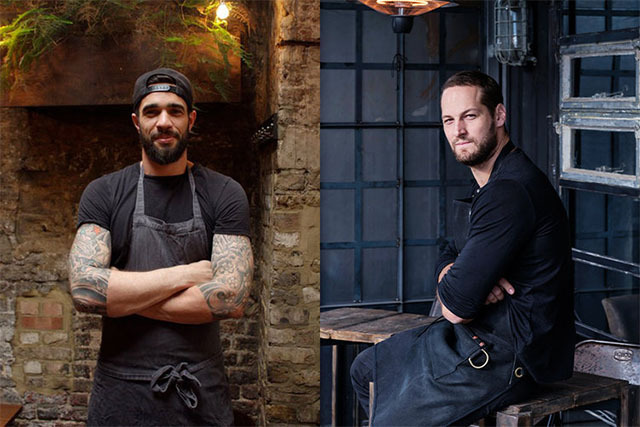 London restaurants and open fire cooking aficionados Smokestak and Smoking Goat will be collaborating to create a pop-up restaurant unlike any other. Festival-goers will be able to experience the exceptional cooking of head chefs Ali Borer (above left) and David Carter (above right) each day of the event, at breakfast, lunch and dinner. A second pop-up restaurant will be run by Rick and Katie Toogood of Prawn on the Lawn with guest chefs. 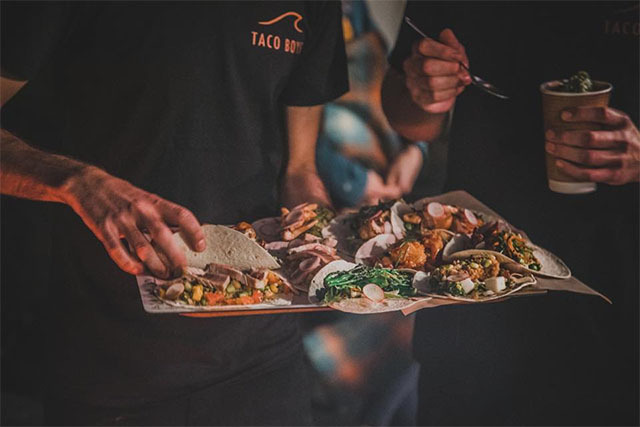 In addition to the pop-up restaurants, several special long table feasts will take place, hosted by Brat’s Tomos Parry and renowned vegetarian chef Anna Jones, and the festival will open on the Friday night with Cornwall’s biggest ever long table feast cooked by The Hidden Hut’s Simon Stallard. In addition to the amazing food, there is a programme of talks, workshops, outdoor experiences, wellbeing classes and family activities. There’ll be music from Villagers, Tom Odell, Mr Jukes and Gilles Peterson, amongst others. For full details about the festival and its line-up, see www.porthillyspirit.com. 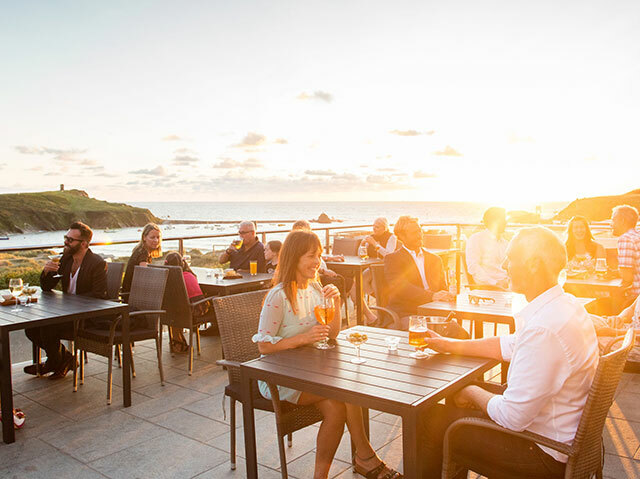 The Beach at Bude’s next wine tasting dinner will be held on Friday 5 April, when the hotel’s head chef Jamie Coleman will be delivering a six course feast with matching wine flight. Expect delicious food and wine, and a fun atmosphere. Dishes include quail Kiev, slow cooked duck egg with asparagus, coronation crab, beef fillet, rhubarb and buttermilk, and chocolate and caramel with Jerusalem artichoke ice cream. There is also a vegetarian tasting menu available. £45pp including a paired wine flight, phone 01288 389800 to book a table. Special room rates also available. More details here. A week of Easter-themed cookery classes will take place from Tuesday 9 to Saturday 13 April at the state-of-the-art Truro School Cookery School. 10am to 4pm, Tuesday 9 April, Children’s Easter Cookery, recommended age 10-14 years. Making hot cross buns, fish cakes with homemade tartare sauce, and chocolate Easter egg decoration. £55pp. 10am to 4pm, Wednesday 10 April, Teenagers’ Easter Skills Cookery, recommended age 14-17 years. Making the ultimate chocolate fudge gateau, Cornish fish pie, and chocolate Easter egg decoration. £65pp. 10am to 4pm, Thursday 11 April, “Spring has Sprung” Skills Cookery Course. Making asparagus with poached duck egg and romesco sauce, spring vegetable risotto, warm salad of new season lamb with chargrilled baby gem, and rhubarb and almond tart with vanilla clotted cream. £90pp, which includes lunch with paired wine, plus a generous three-course supper to take home. 10am to 4pm, Friday 12 April, “Get Set for Easter” Baking Skills Class. Making simnel cake, hot cross bun Easter ring with orange spiced butter, marbled meringue nests, and a leek and Gruyère tart. £90pp, which includes lunch with paired wine, plus a generous bag of what you’ve made to take home ready for Easter. 10am to 3pm, Saturday 13 April, Family Feast for Four. 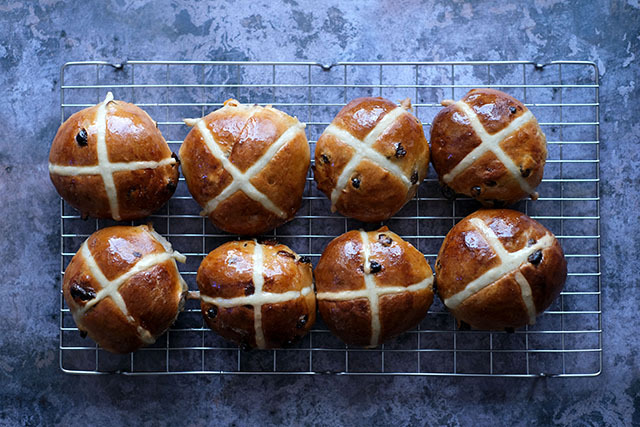 Making asparagus with poached egg and romesco sauce, chicken Kiev with wild garlic and purple sprouting broccoli, rhubarb and almond tart, and a hot cross bun Easter ring with orange spiced butter. £80pp, which includes a two-course meal for four people to take home, along with a bottle of paired wine and a bottle of “posh pop”. Prices include all ingredients, lunch and refreshments, plus participants get to take home everything they make. For full details of all courses, and to book online, visit truroschoolcookery.com. Gemma Smale-Rowland, a dairy farmer from North Petherwin, near Launceston, has launched Cornish Moo, cream-topped milk in traditional, refillable glass bottles. The non-standardised, non-homogenised milk is from her own herd of pedigree Holstein cows, which started with an animal given to her by her parents for her 21st birthday. The milk is available directly from South Hellescott Farm, from a specialised vending machine, from 7am to 7pm every day, and is priced at £1.20 per litre. 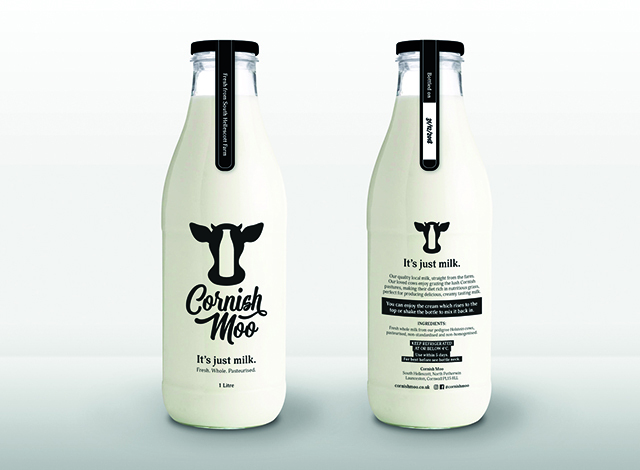 Cornish Moo is also available to buy in bottles at Tre, Pol & Pen. See Facebook for updates. 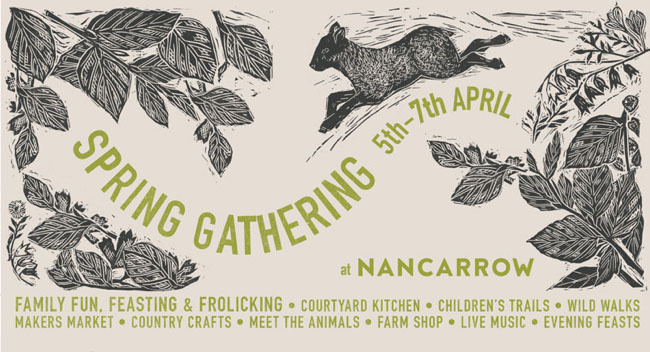 Nancarrow Farm’s annual ‘Spring Gathering’ celebrates the arrival of spring, and takes place over the weekend of 6 and 7 April. During the day there’ll be craft stalls and demonstrations, wild walks and children’s trails, street food from the Courtyard Kitchen, and live music. There’ll be taster sessions in butchery skills, and a pop-up shop selling Nancarrow’s own produce, including organic meat, wool, prints and jars of preserves. The farm’s Spring Feast will be held on the Saturday evening, and features beef rump. Daytime tickets for the Spring Gathering are £5 per adult and £3 per child. Feast tickets are priced at £40 per person, including a drink on arrival, canapés, and a three-course dinner. Book online. Stargazy Inn in Port Isaac reopens in the first week of April with a fully refurbished restaurant and bar, and a new head chef, Andrew Sheridan, who appeared on Great British Menu last year. Andrew will put his stamp on Stargazy Inn with a new bar menu with his own take on Cornish classics such as deep fried sprats, a lobster and crayfish butty, and a Stargazy fish pie. In the restaurant there will be tasting and à la carte menus, with dishes such as torched mackerel with cucumber and dill, salt baked beetroot, and Cornish lamb with onions and wild garlic. 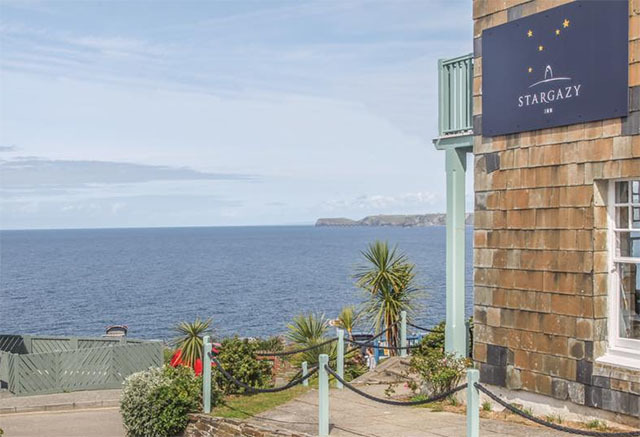 Stargazy Inn is a gorgeous Victorian villa, which sits just across the road from Restaurant Nathan Outlaw, and has a view over the bay from Port Isaac to Tintagel castle. There are also nine beautiful bedrooms in the property, which has been refurbished by owner David Barnard, who also owns Port Gaverne Hotel and Pilchards Café. For more details visit stargazyinn.co.uk. Sands in Newquay offers “Twilight Sessions” most Friday and Saturday evenings outside school holidays. 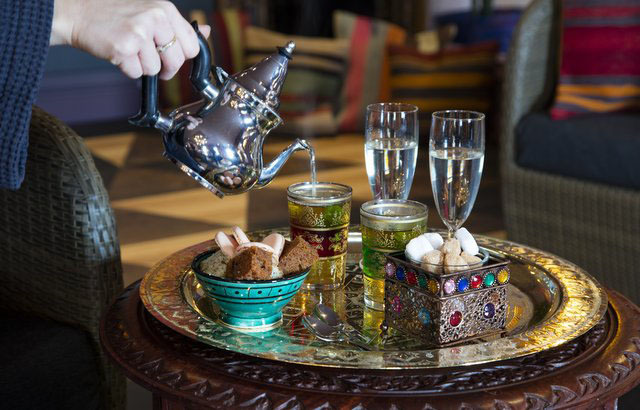 The package includes a 90 minute Moroccan Spa Experience at 4.15pm or 6pm, and use of the hot tub and heat room. Guests will be served cake, fresh mint tea and a glass of Cava in the Moroccan Lounge, and will end the evening with a two course dinner in the Beachcomber Restaurant. For the dinner menu, see here. £39 per person, booking essential. For full details see here. The Laid Back Coffee Co., which sells great coffee and cakes, is due to open in Wadebridge by Easter. The café will be located in one of the new shipping containers on Goldsworthy Way; the containers will be known collectively as The Salt Box. Woody’s Pizza will be taking up residence in another container. Woody’s already has a loyal following at its regular pitches in North Cornwall, and serves delicious wood-fired pizzas. The other two containers will also be home to food-based businesses, and there are plans for three more containers to be installed on top. Watch this space for more news! 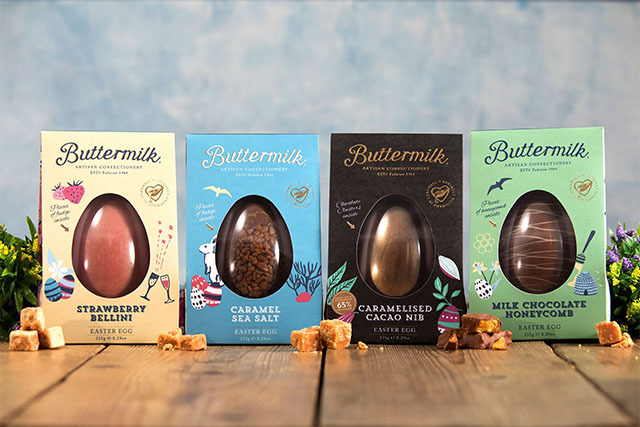 This year, Buttermilk’s range of single origin Colombian chocolate Easter eggs has been expanded. The new products are a milk chocolate honeycomb egg, and a dark chocolate caramelised cacao nib egg, which sit alongside two of last year’s flavours – caramel sea salt and strawberry Bellini. As well as Easter eggs, Buttermilk has a Great Taste award-winning hot cross bun flavoured fudge, packed full of juicy raisins and fragrant fruit peel. The Easter eggs are available at Waitrose and independent shops, the fudge is available at Sainsbury’s, and all products can be purchased in Buttermilk’s shops in Cornwall and online. For more information, visit buttermilk.co.uk. Family run since 1999, the hugely popular Life’s A Beach on Summerleaze Beach is re-opening after a complete renovation. The bistro will continue to serve food and drink throughout the day and evening, with front-row sunset views. As well as a new look, there will be a new menu, which will be available to sample with complimentary tasters at their re-launch party from 5.30pm on Friday 29 March. The Scarlet’s head chef Mike Francis has launched a new five course spring tasting menu (with matching wine flight) celebrating beautiful spring flavours, and has also created a vegan tasting menu with paired vegan wines. This five course tasting menu is available as part of The Scarlet’s Spring Gourmet Break, which also includes two nights’ accommodation, a three course breakfast each morning, a three course candlelit dinner in the sea view restaurant, and use of the gorgeous spa. Available until 23 May, with prices starting at £750 for two people sharing a Just Right room. For more details see here. 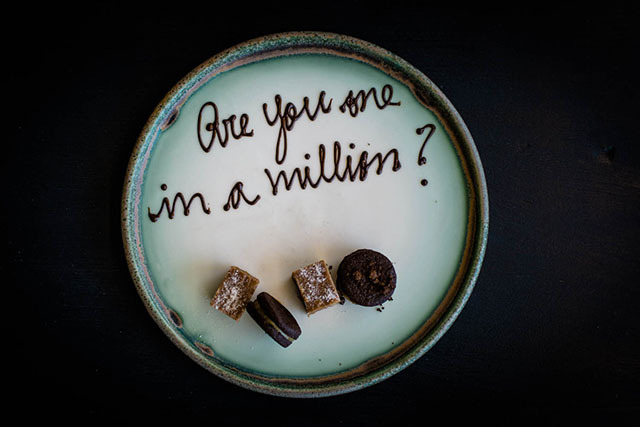 Fifteen Cornwall is expecting to serve their one millionth guest this April, and to celebrate this milestone, they’re giving every breakfast, lunch and dinner guest in April the chance to win a special prize. The winner will be invited to return in VIP style as a “one in a million” guest, with a three night stay for two people at Watergate Bay Hotel, with dinners at Zacry’s and The Beach Hut, and a special six course tasting menu with a paired wine flight at Fifteen Cornwall. The prize also includes a bespoke experience – a surf lesson with the Extreme Academy, a cocktail masterclass, or be a chef for the day in the Fifteen Cornwall kitchen. To find out more and to book your table see website. If you fancy going out for Sunday lunch, but don’t want a traditional roast, then try Barnaby’s in Padstow, sister restaurant to Prawn on the Lawn. This cosy bistro on Duke Street serves delicious middle eastern style small plates, as well as larger sharing plates, all cooked in the wood-fired oven and packed with flavour. 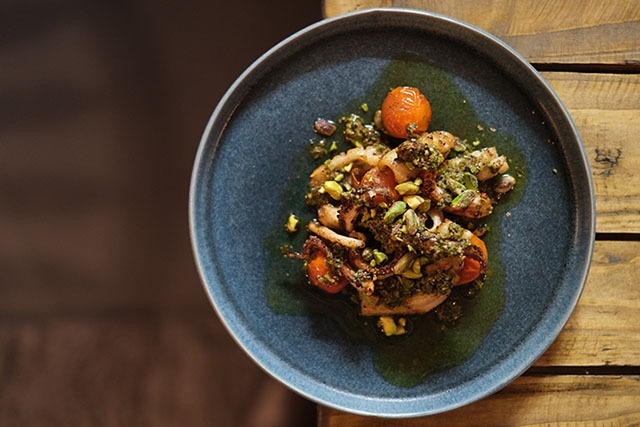 Pictured above is the squid with tomato, zhoug and pistachio. Barnaby’s will be open on both Mothering Sunday and Easter Sunday from 12pm until 9.30pm. To see the menu and to book a table, visit barnabyspadstow.com. Rupert Cooper is busy filling up Philleigh Way Cookery School’s calendar with lots of lovely new courses. Also new this month is the first of the “Tuscan Tuesdays”, which kick off on Tuesday 23 April and then take place monthly. A quick Italian cookery lesson of two dishes (with demo and practical session) is followed by a two course supper and a glass of wine. £49pp. 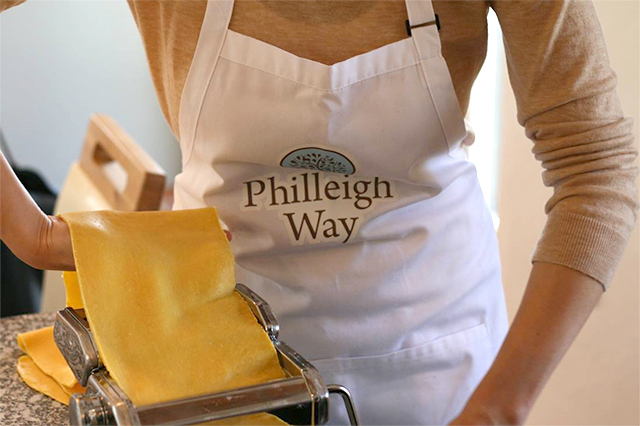 For full details of all courses and events, and to book online, visit philleighway.co.uk. 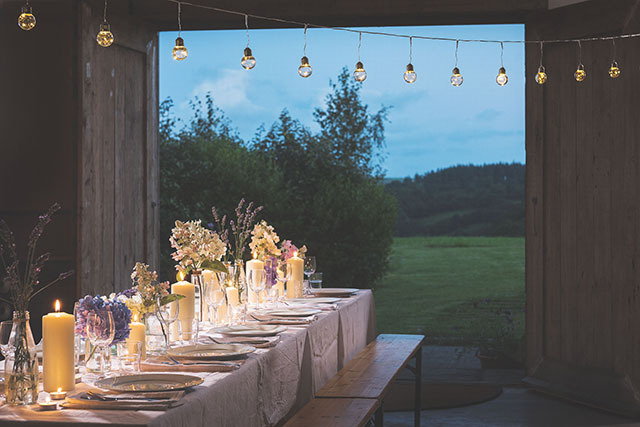 Craftworks‘ pop-up restaurant at Trerethern Farm (home of Padstow Kitchen Garden) just outside Padstow will be opening for the season on 26 April. Don’t miss the Sexi Mexi hotdogs, made with sausages from the farm. Craftworks new “Craftworks At Knightor” in Portscatho is taking shape and will be opening on 19 April. Set in a barn at Knightor’s vineyard, there’ll be a lounge area and bar, with views of the rolling countryside. Also new for 2019, Craftworks is launching its first ever beer, Craftworks IPA 4.5%, in collaboration with St Austell Brewery. It will be available in both the Padstow and Portscatho locations throughout the summer. Porthleven Food Festival takes place around the harbour, shipyard and playing fields in Porthleven from Friday 26 to Sunday 28 April, with live music, dozens of food and drink stalls, and a full line-up of cooking demos. Festival-patron Antony Worrall Thompson will open the festival at 10am on the Saturday and he’ll then be cooking on stage with Porthleven’s own Jude Kereama. Big names popping down to Cornwall for the weekend include Gareth Ward, Josh Eggleton and Sally Abe. Chefs representing Cornwall include Chris Eden, Guy Owen, Mick Smith, Stephane Delourme, Ben Prior and Ben Tunnicliffe. There will also be a food and wine pairing demo from Fifteen Cornwall, a Japanese cooking lesson from Naoko’s Kitchen, and a demo by the staff and students of Cornwall College. The festival is free to attend with tickets only required for the Shipyard Sessions in the evenings. Keen foodies can guarantee a priority seat in the Chefs’ Theatre, as well as a bridge pass for easy access around the harbour, and entry to all three evening events, by purchasing a Gourmet Ticket for £39 in advance (£45 on the day). Camping is available on site. For full details see porthlevenfoodfestival.com. The team at Rick Stein’s Restaurants is running two competitions at the moment. 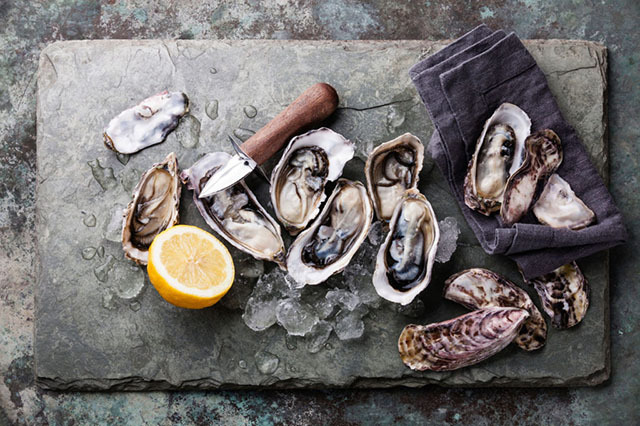 In the Shuck it and Sea prize draw, there is the chance to win seafood experiences, and a bottle of Champagne for a group of up to six people, at Rick Stein’s Falmouth. A winner will be randomly picked during each quarter, who’ll get to choose from an oyster shucking and tasting experience, fruits de mer experience, or scallop shucking and tasting experience. Enter here. In the Taste of Cornwall competition, one lucky winner will win a foodie weekend break in Padstow, plus a one day cookery course at Rick Stein’s Cookery School, a tour of Tarquin’s distillery, and a hamper packed with Cornish goodies from the Rick Stein Made in Padstow range and from Harbour Brewing, Tarquin’s Gin, Whistlefish, Cornish Seasalt, Roddas and Cornish Orchards. Two runners up will also receive a Cornish hamper. Enter here. The Mariners in Rock will reopen this spring, after an extensive renovation, as part of the Paul Ainsworth family. The pub’s new head chefs, Joe Rozier and Tom Dawes, have moved across the estuary from No 6 and Rojano’s respectively. The Mariners will be open from breakfast through to dinner; expect pub grub with a No 6 twist and a dash of Ainsworth magic. We can’t wait. Don’t miss No 6’s head chef Chris McClurg on the current series of Great British Menu, where he’ll be representing his homeland, Northern Ireland. Chris was named “Young Chef of the Year” in last year’s OFM Awards. Paul Ainsworth will appear as a judge in this year’s series, and Emily Scott will be competing in the South West round. Opening in June, Fitzroy of Fowey is the latest restaurant from the team behind Westerns Laundry in London. They will be located in a former bank in the centre of Fowey, and are currently recruiting for all positions. See their Instagram feed for more information. Ross Geach is opening up a farm shop at Padstow Kitchen Garden this spring. The shop will sell fresh vegetables, eggs and flowers, and delicious Trerethern Farm sausages. Tim Spedding (ex Clove Club) and his partner Louise Rødkjær, who have recently both moved on from Coombeshead Farm, will be running regular supper clubs near Rock from April onwards. Keep an eye on Tim’s Instagram feed for more details. Bufala has opened in Fowey, and serves: “Lovingly sourced, authentic Italian ingredients, from bufala burrata mozzarella from Campania, salamis, hams and cheeses from Bologna to our apperitivi, spritzes, wines and unmissable home-made tiramisu.” Sounds great. Visit bufalafowey.co.uk for more info. 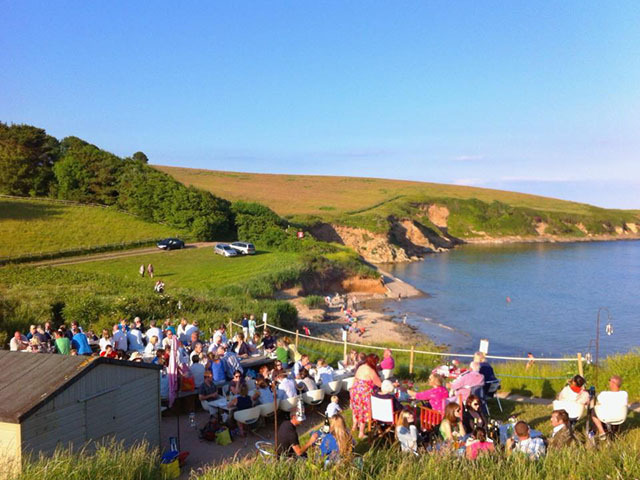 The Camel Trail’s popular Cornish Crêpe Co. has moved this year, and is now known as the Atlantic Coast Express. You will find them housed in a train carriage on the Camel Trail, located halfway between Wadebridge and Padstow, from Saturday 6 April. The new spring evening menu at Temple in Bude looks delicious, and features dishes such as: charcoal grilled mackerel with chermoula and preserved lemon yogurt; fried violet artichokes with herbs, fennel and chilli; day boat hake with aioli, spring greens, fennel and chilli oil; buttermilk panna cotta with preserved winter citrus; and coffee, cardamom and halva brownie with sesame brittle. Yum. Temple is also open for breakfast/brunch, lunch and small plates. Book a table here. Azura Restaurant & Bar is opening on 29 March at The Valley, Carnon Downs. Chef Mark Callaby offers ‘modern homestyle cuisine’, inspired by his travels and time spent working abroad. A special Mother’s Day lunch will be available, and Sunday roasts will be served every week from 12.30pm to 7pm. Azura will also be holding a series of pop-up nights with guest chefs, the first of which will be a Ssshi night with Naoko’s Kitchen on 4 May. See website for more details. 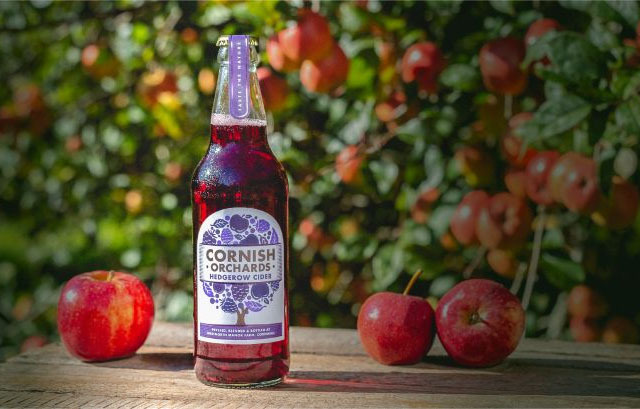 Cornish Orchards has launched its delicious new sweet and fruity “Hedgerow Cider”, which is made with juicy dessert apples, and blended with dark fruits from the hedgerow including blackberries and sloes. A new food festival has been announced for September. 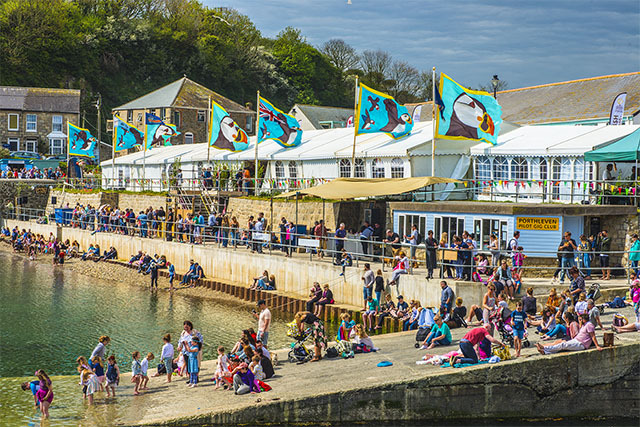 Truro Food Festival will be organised by ILOW, which currently runs the Porthleven and St Ives food festivals, and will be held on Lemon Quay over the weekend of 27 to 29 September. The St Ives Food and Drink Festival takes place over the weekend of 10 to 12 May, and as well as a host of food and drink producers and chef demos, there will also be a new music venue. More details in the May Foodie Diary. MELT reopens at Treyarnon Bay on Sunday 14 April, selling ice cream, cakes, grills and coffee. Beach Box is now open in Polzeath from 8.30am to 5.30pm, and will be opening in Padstow, Wadebridge and Mawgan Porth soon. Mount Haven re-opens after its extensive refurbishment, with a new restaurant and terrace space, on Friday 12 April. By all accounts, it’s going to look fabulous, and has great views across Mount’s Bay to St Michael’s Mount. Head chef Ross Sloan is working on brand new menus in time for the launch, and the bar and restaurant will be open to both hotel residents and guests throughout the day. Join Emma Gunn and Potager chef Daisy Hillier for a foraging walk and three course foraged feast, £45pp, book online. 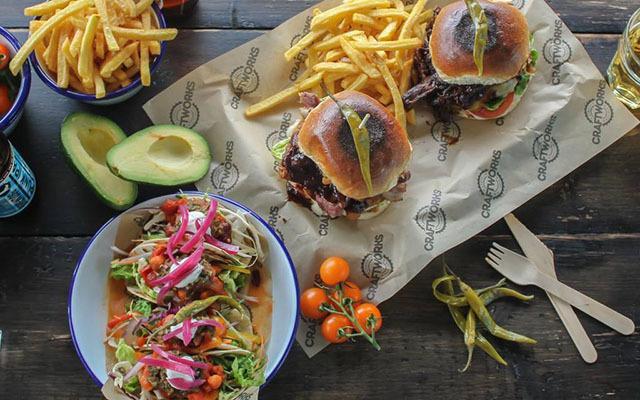 Pentewan’s popular Hubbox reopens for the season on 27 March, and will be offering 20% off your bill if you visit between 27 and 31 March. Thursday 28 March Tour of Harbour Brewing Co.
Harbour Brewing Co.’s first tour of their Modern Classic Brewery and the new Hinterland Brewery. Includes three beer tastings and access to the new taproom and brewery shop. 3pm, £15pp, book online. Tuck into rosemary studded leg of lamb, braised lentils, onions, smoked lamb bacon, roasted savoy hearts, heritage carrots, salsa verde, crispy shallots. Following the long table feast wrap up warm and gather around the fire pit amongst the dunes. £35pp book online. Kate Attlee will be cooking a Middle Eastern supper, with drink and canapés followed by “a delicious and plentiful spread” at Emily’s in Truro. £35pp, including wine, book online. 10am – 1pm, a selection of local producers will be at Tre, Pol & Pen’s inaugural spring market. If you are interested in having a stall at the market, please email [email protected]. There’s a beautiful looking menu at The Beach at Bude for Mothering Sunday. 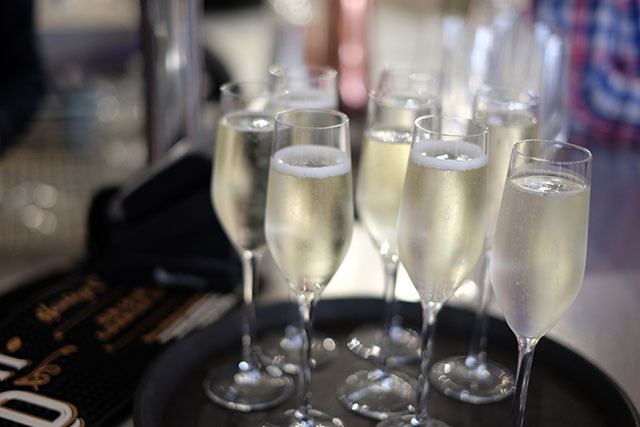 Two courses for £18.50 and three courses for £22.50, with a glass of Prosecco on arrival for all mothers. See here for the full menu, and to book phone 01288 389800. Philleigh Way’s Woodfired Kitchen’s first event of the year, with a three course lunch to celebrate Mothering Sunday. Three courses, £28pp, book online. Join Potluck Cornwall and the new owners of Grounded in Truro for an evening of American dining. £28pp for three courses and coffee, BYO wine, book online. Every Thursday from 4 April head chef Craig Tregonning will be serving up a Middle Eastern feast, available to eat in or take away, £10pp. A member of the team from Raymond Reynolds Ltd will visit the Old Chapel Cellars in Truro for a tasting of Portuguese wines. £20pp, book online. See above. For more info see website. Back again for its monthly visit to Crantock Village Hall, The Market has everything from coffee and fresh veg to tacos and jewellery. There’s free parking, a playground and a skate park, and is dog friendly. Potluck Cornwall has organised this lovely sounding event. Bring a pudding to share, and illustrator Mel Chadwick will give tuition in drawing and watercolours. £20pp, book online. 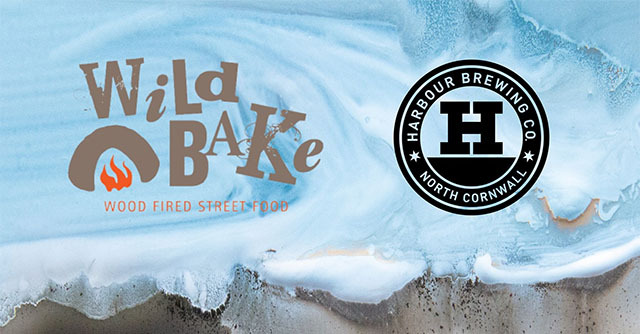 Wild Bake will be serving its delicious wood-fired pizzas from its famous converted trailer, to be washed down with fresh beer straight from the brewery, at Harbour Brewing Co’s new tap room. A family event for all to come and relax. No tickets required. 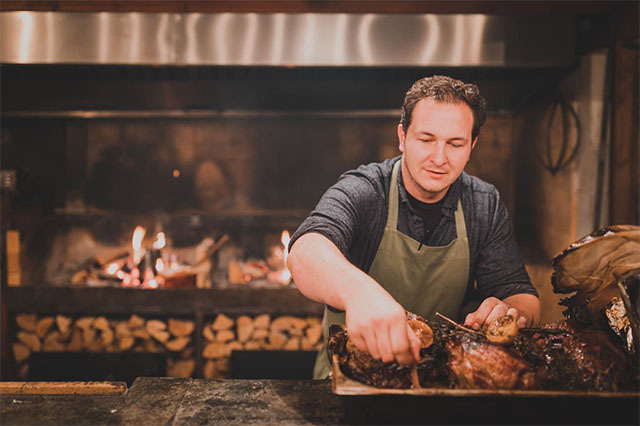 James Kittow Butcher is hosting a lunch in the rustic barn at Kilhallon Farm, and will be serving up their own Red Ruby beef and Mr Bax’s roast pork with all the trimmings. Children can meet the animals too. For more info and to see the menu see here. Jeremy Lee of Quo Vadis, Aaron Mulliss of The Hand and Flowers, Jonny Lake, formerly of The Fat Duck, Paul Cunningham of Henne Kirkeby Kro, and Nathan Outlaw will join the Coombeshead Farm team to cook a seven course dinner in aid of Parkinson’s UK and The Stroke Association. £240pp, to book email [email protected]. Enjoy three different soft tacos, all with their own distinct flavours. Complimentary nibbles beforehand, and bar and dessert options on the night. £16pp, book online. A special menu showcasing the best cuts from Tre, Pol & Pen’s own herd of North Devon Ruby Reds, with a selection of matching wines. To book phone 01566 706527 . Pura Pressed is hosting this event at Archie Brown’s in Truro. Three courses of plant-based dishes, £25pp, book online. Camel Studio’s first feast of the year is a four course extravaganza from chef Liam Smith-Laing, celebrating the best of spring ingredients, including a wild garlic chowder with Porthilly mussels, and a spring lamb ragu with creamed polenta. £30pp, book here. Christopher Biggins will host this charity tea party in aid of The Royal Osteoporosis Society at Hotel Tresanton. Enjoy Champagne, delicious savoury finger sandwiches, homemade scones, jelly and a selection of indulgent cakes and pastries baked by former Claridge’s pastry supremo Alan Holloway. £100pp, book online. An hour long masterclass on gin with Ruby’s Bar’s expert bar team. Learn about a variety of different gins, and how to select the perfect garnish, with tasters along the way. £15pp, book online. Taste a range of gins, find out how they are made, and learn how to turn them into the perfect drink. £25pp, see here. Five grape varieties and ten bottles of wine will be tested in this Old World vs New World wine-off. The tutored tasting will be led by the brilliant Ruth Benney of St Austell Wines at Truro School Cookery School, and will be accompanied by nibbles. £26.87pp, book online. 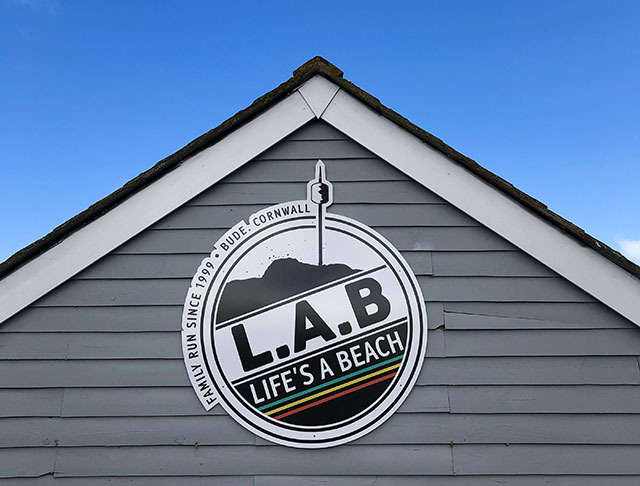 Taco Boys are teaming up with Harbour Brewery to celebrate the launch of their new venture at Baby Bay in Polzeath. They will be open all day from 10am with special offers available from 6pm. The Cornish-inspired tacos will be £6 each, or three for £15. No website yet, see Facebook or Instagram for updates. Join Emma Gunn on a coastal and seaweed forage at Porthpean beach. Emma will show participants what is edible, share recipes and introduce new flavours. £15/adult, £5 for 6-16yrs, under 6s free. Book here. 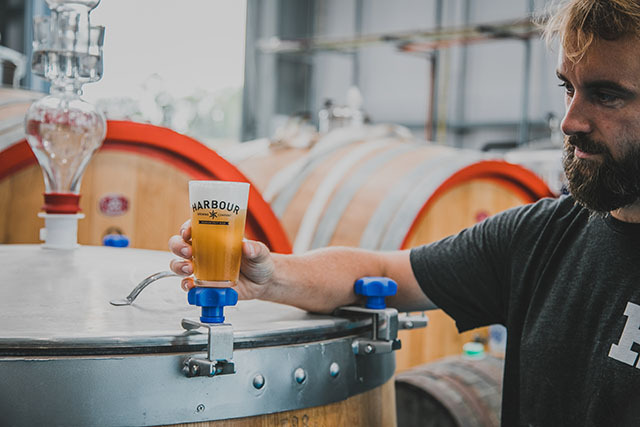 A tour of Harbour’s Modern Classic Brewery and the new Hinterland Brewery. Includes three beer tastings and access to the new taproom and brewery shop. 3pm, £15pp, book online. This fusion feast features dishes from Hawaii and Asia, starting with Chinese buns filled with Dong Po pork belly, cucumber, spring onions and hoisin sauce. Followed by Hawaiian poke, bowls of sticky rice, spicy marinated tuna, pickled ginger, wakame, avocado, crispy nori and spicy mayo. All with a beach bonfire, seating at long tables and live music. £30pp, book online. 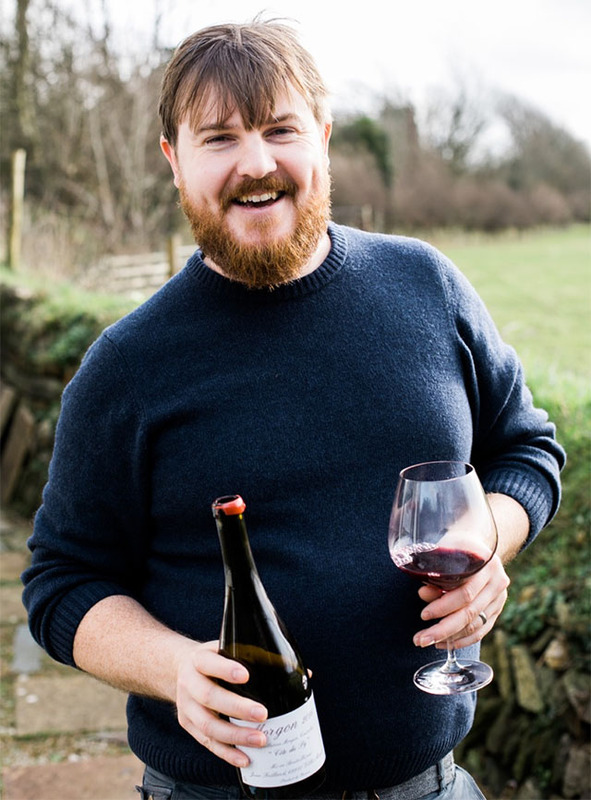 Drop in to St Kew Farm Shop any time between 12pm and 3pm on 27 April, where Martin Buchanan will have gathered a selection of wines to try. Wine tasting is free, with bottles available to purchase. After the success of the first Wadebridge Cornish Market, the next market will take place from 10am to 4pm on 27 April. Expect over 20 stalls selling food & drink, and arts & crafts. The first market raised £80 for charity. See Facebook. These informal sessions are designed with the novice gardener in mind. If you’re keen to start growing your own veg at home but not sure where to start, then sign up to learn how to get growing the easy way. £25pp including a campfire lunch and tea and cakes. Book here. An afternoon of gin, food and entertainment at the lovely Mount Edgcumbe. There’ll be live music, outdoor games, and the chance to take part in a gin masterclass with Sunday Telegraph’s drinks columnist Susy Atkins. For tickets and more information see Facebook. Ottolenghi development chef Oli Pagani will be heading to Cornwall for two nights of special food at Temple in Bude. Read more about Temple Takeovers here. Azura’s first pop-up event is a sushi night with Naoko’s Kitchen. £30pp, includes sushi selection platter, Japanese dessert and cocktail. To book phone 01872 870695. We love to hear from you – please send your May food news by 24 April, by emailing [email protected]. Feel free to comment below, and don’t forget you can follow us on Instagram, Facebook and Twitter.